Nikon has unveiled its latest flagship pro DSLR camera, the D4, which features more than 45 new or improved features from the D3s. A 16.2 million pixel FX format (full frame) sensor has been newly developed, while the camera also includes the latest EXPEED 3 image processing engine for ultra-fast shooting speed. The new camera is primarily being targeted towards sports, news and reportage photography, and will be available before the London 2012 Olympics. The D4 is capable of shooting at up to 11fps, which is faster than any other Nikon DSLR. Low noise images are promised thanks in part to optimised and redesigned 14-bit A/D signal processing which is built into the new sensor. The standard sensitivity range is ISO 100-ISO12800, but this is expandable down to the equivalent of ISO 50 and up to ISO 204, 800. Movie recording on the D4 has been improved, with Full HD video recording available at 30p, 25p, 24p and this can be increased to 60p for slow-motion movies at 720p HD. Clips can be recorded for up to 29 minutes and 59 seconds at a time. A new multi-area mode has been introduced, which means that videos can be recorded in both FX and DX based formats, as well as in native full HD (1920 x 1080 crop), meaning that the same lens can be used to capture the same scene with different crop factors. Other new video features include an audio output for external headphones, uncompressed HDMI output for professional quality editing and the ability to tag important frames in the video while recording for quick location when editing. The D4 features Nikon's own Advanced Scene Recognition System, which incorporates the newly designed 91,000 pixel RGB sensor which analyses each scene for accuracy. 3D tracking can be used for shooting and tracking smaller subjects, while human faces can also be detected. Also redesigned is the Multi-CAM3500FX AF Sensor module, which has 9, 21, and 51 point coverage settings for fast subject detection. The redesign means that autofocus is claimed to be possible in extreme low-light situations, down to -2 EV. Designed with sports and wildlife photography in mind, the D4 can maintain the power of eleven central AF sensors, which includes one cross-type even if the combined aperture is f/8. This is particularly useful when shooting with extenders, as for example if using a 600mm f/4 lens with a 2x teleconverter, the power of 15 central AF sensors (of which 1 is cross type) are available at the effective aperture of f/8. The shutter unit has been redesigned with a Kevlar/carbon-fibre shutter unit, which has been tested up to 400,000 releases, with a maximum shutter speed of 1/8000 and flash synchronisation at up to 1/250 seconds. Operations speeds are also quick on the D4, boasting a start-up time of 0.12 seconds, and a release lag of 0.042 seconds. Two card slots are offered on the D4, including, for the first time on any camera, a slot for the new XQD memory card format which was recently announced. The other is a high-speed UDMA 7 CF card slot. For photographers using the camera at important events, connectivity has been improved. Wireless LAN support is available via the newly designed WT-5 wireless transmitter, which features HTTP and FTP connection modes, while the HTTP has also been designed to work with iPhone and iPad screen resolutions. A wired LAN connection is integrated into the camera body - a Nikon first. Whether using the camera in portrait or landscape mode, the button layout is identical, while several of the ergonomics of the camera have been redesigned. AF and AF-area mode selection are now possible without taking the eye away from the viewfinder, while one-handed operation has been made easier, while the shutter release button has also been angled at 35 degrees for more comfortable use. On the rear of the camera is the newly designed 3.2 inch wide-viewing angle LCD monitor with automatic brightness control. With a 921k dot resolution, the screen has been improved to very closely resemble sRGB colour space, for accurately checking images during playback. Other notable features of the D4 include the ability to create and playback time lapse movies, without need for a PC, HDR shooting and refined colour temperature control, as well as in-camera editing. 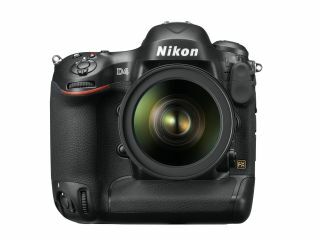 The Nikon D4 UK price is set to be £4,799.99 (RRP), with a release date of 16 February 2012.